The ThinkSystem NE2552E Flex Switch and QLogic Ethernet adapter are solution tested by Lenovo to provide the best integration possible for Lenovo compute, storage, and networking in the data center. Flex System compute, adapter, and switch options, designed to work together result in smooth installations and reliable operations. The NE2552E interoperates seamlessly with Flex System compute nodes, connecting the latest ThinkSystem SN850 and SN550 nodes and ThinkSystem QLogic Ethernet adapters to the network at speeds up to 100Gb with Universal Remote Direct Memory Access (RDMA) and Unified Fabric Port (UFP) for lowest latency. The NE2552E assumes the warranty of the Flex System chassis in which it is installed. 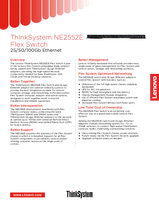 Support for all Flex System components is provided by Lenovo award-winning customer service as the single point of contact. Lenovo XClarity hardware and software provides easy single-pane-of-glass management for Flex System and Lenovo server, storage, and networking products. Limited Warranty Assumes the remainder of the Flex System chassis 3-year warranty and warranty service upgrades when installed; 1-year warranty outside the chassis, or if the remainder of the chassis warranty is less than 1 year. Lenovo is a leading provider of systems for the data center. The portfolio includes rack, tower, blade, dense, and hyperconverged systems, and provides enterprise-class performance, reliability, and security. Lenovo also offers a full range of networking, storage, software, and solutions, as well as comprehensive services that support business needs throughout the IT lifecycle. To learn more about the ThinkSystem NE2552E Flex Switch and ThinkSystem QLogic Ethernet adapters, contact your Lenovo representative or Business Partner, or visit lenovo.com/networking. For detailed specifications, consult the switch product guide, or the adapter product guide. Trademarks: Lenovo, the Lenovo logo, Flex System, Lenovo XClarity, and ThinkSystem are trademarks or registered trademarks of Lenovo. Access® is a trademark of Microsoft Corporation in the United States, other countries, or both. Other company, product, or service names may be trademarks or service marks of others. Document number DS0040, published May 7, 2018. For the latest version, go to lenovopress.com/ds0040.